African International Destination: Space, more commonly known as AIDS, is a multi-national African agency whose goal is to eventually reach Outer Space. With member nations such as Congo, The Democratic Republic of the Congo, The People's Green Libertarian Congo, and Egypt, it is Africa's response to NASA and the European Space Agency. Thus far, AIDS has enjoyed very little success in regards to its lofty objectives, mostly due to the lack of available funds, lack of technology, lack of education, and lack of skilled personnel. Its failures have also been traced to rather unorthodox methods and practices. Regardless of its success, fervent interest in the program has gripped all of Africa, and the 'AIDS epidemic', as it has come to be called, is sweeping the continent. AIDS was founded in West Africa in 2005 by Chief Man Who Dreams of Sky and Young Man Who is Intrigued by Moon. Originally, the entire program consisted of shamans and witch doctors who would gather in huts and pray to the Gods of the Sky to lift them to the heavens. When this was unsuccessful, they climbed hills or very tall trees in order to be heard better by the Sky Gods. After several months of fruitless praying, the agency shut its doors due to a lack of interest. Just a few months later, several prominent Hollywood celebrities spoke out on the subject of AIDS, and enough support was gathered to re-open the program. In order to make a point, AIDS engineers burned down the trees believed to be inhabited by the Sky Gods, and also shook their spears at the Great Mountain where the Snobby Elite Gods were believed to reside. In the last several years, AIDS has made gazelle-like leaps and bounds throughout Africa. Their experiments have shed light on several areas, such as how hard it is to get to space. Also, technology developed by the program has greatly impacted everyday African life, such as Stick With Rock Tied To It and Big Pile Of Mud. The program's need for TNT has also resulted in explosives manufacturing facilities popping up throughout Africa. TNT production has recently passed elephant poaching, safaris, and getting eaten by crocodiles as Africa's largest industry. AIDS administrators at the state-of-the-art AIDS mission control. 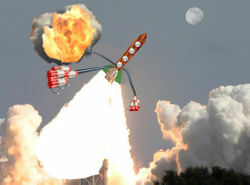 AIDS has come a long way from its original projects consisting of dysfunctional slingshots and catapults, and has evolved into producing dysfunctional space shuttles that explode after barely reaching 50 feet. Although AIDS officials are happy with their poorly constructed wood and unnecessarily placed dynamite, AIDS engineers are looking into new, more efficient methods of construction. These methods include placing more wood near the bottom of the shuttle in an attempt to shield it from the massive amount of TNT required to make it leave the ground. Many technologies developed by AIDS have not yet reached the public domain in Africa. These developments include Spitting On Wood To Make It Stick To Other Wood and Dyes For Make Space Boat Look Cool. It is estimated that by the year 2020, Africa will be propelled into the 21st century by these and many of AIDS' other advancements. At the AIDS Technological Research Center, located at Large Tree With Animal Faces On It, AIDS researchers are constantly trying new methods of technological development. The turnover rate for these researchers is high, however, due to excessive TNT-related experiments. That AIDS is mentioned in the Guinness Book of World Records for largest amount of failed attempts to enter space? 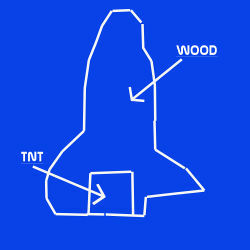 An advanced Blue Print of an AIDS Space Shuttle. 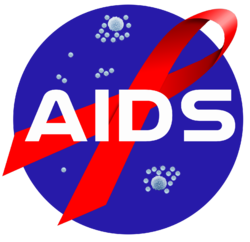 AIDS has been known to undertake dozens of space missions per year; however very few have actually been confirmed a success. Their recent trend away from slingshots and catapults hasn't fared very well: the AIDS TNT-powered space boat altitude record stands at 57 feet. Despite its lack of historic success, AIDS marches on throughout Africa, sweeping up the young and old alike. Was The Outcome Successful ? A typical AIDS Space Boat, propelled by rods of TNT attached to it via sticks and rope. A tragic time in AIDS history was the Great Mud Deficit of 2006, in which a heat wave hit 85% of the continent and made it very hard to produce mud. The mud manufacturing industry took heavy losses, and the primary construction material for all AIDS projects was in short supply. For several months, Space Boats were built out of less desirable materials, such as steel, glass, and heat-resistant ceramic. However, monsoon season ended the Great Mud Deficit, and soon AIDS engineers discarded their half-built mudless projects to return to refining their mud-making and mud-based building techniques. AIDS has never fully recovered from the Great Mud Deficit, although precautions are being taken to ensure that a similar event never occurs again. Large quantities of mud are being hoarded in secret caverns deep in the jungles of Africa, and comically large portions of the savannah have been designated as 'emergency mud-making locations'. In the event of another mud deficit, these locations will be the subject of a top-secret mud manufacturing technique, which is rumored to use some sort of magical liquid to transform ordinary dirt into mud. ↑ It is also a rebuttal to the Russian and Chinese space programs, but less so, as those programs aren't very good, thank you very much. ↑ The most prominent Gods of the Sky being Jake, God of the Clouds, and Jeff, God of the Large Illuminated Disk. ↑ Though vegetables were often employed in the process. ↑ Such as the Pope. ↑ Africa, Toto et al. ↑ It is estimated that the AIDS program gives the ACME company 30% of their total business. ↑ Not to mention the highly anticipated TNT-powered car. ↑ Which followed the Trees Falling Over Panic of 2003. This article has been re-featured on the front page. — You can nominate your favourite featured articles at Uncyclopedia:Re-feature queue. This page was last edited on 11 April 2019, at 21:39.